The original Floor-Leverage Rule for Retirement calls for establishing a low risk Spending Floor Portfolio with 85% of one’s funds and a Surplus Portfolio of the remaining 15% in equities with 3× leverage. Unfortunately there is a high probability that the leveraged Surplus Portfolio will lose most of its value in extremely bad markets. iM’s Improved Floor-Leverage Rule, a low-risk investment strategy for retirement with a high 6.5% withdrawal rate, uses market timing to avoid large losses of the Surplus Portfolio. However, market timing models are unlikely to capture black swan events. For example, the 1987 stock market crash would have wiped out 90% of the Surplus Portfolio in two weeks. A strategy to guard against such a possibility is to buy put options to protect the Surplus Portfolio. For the analysis, the CREF Inflation-Linked Bond Account (CREFb) was chosen as the Spending Floor Portfolio. The timeframe for the backtest was from Jan-2-1999 to Jun-30-2014. Over this 15.5 year period the CREF Account produced an annualized average return of 6.1% with a maximum drawdown of -14.3%. The Surplus Portfolio investment is constantly in the 3× leveraged UltraPro S&P500 ETF UPRO, hereinafter referred to as the UPRO Surplus Portfolio. To limit potential losses of the Surplus Portfolio, one would have to buy put options of UPRO. However, deep out-of-money options of UPRO lack liquidity. A better alternative would be to buy insurance using the more liquid put options of SPY, the ETF tracking the S&P500. For example, currently (Jul-21-2014) SPY Jun-30-2015 $175 PUT costs $5.25, with the price of SPY at about $197.00. This would provide protection for the following 345 days and limit losses to 11.2% of the current value of SPY. The implied put option price (Pi) is approximately $2.82 for a 1 year option per $100 of SPY. For the 3× leveraged Surplus Portfolio one would need to pay 3×Pi for every $100 initial value of the Surplus Portfolio to limit losses to about 3×11.2%= 33.6%. The price Pi will vary depending on market conditions. However, to simplify the analysis it is assumed that Pi stays constant over time. For the Original Floor-Leverage model, which holds UPRO permanently, the put option insurance cost per $100 would be about 3×$2.82 = $8.46 per year. For the Improved Floor-Leverage model, which has an exposure to UPRO for only about 68% of the time, the average annual cost to insure $100 of the Surplus portfolio was for simplicity assumed to be 0.68×3×$2.82 = $5.75. When following the Improved Floor-Leverage Rule (annually moving funds exceeding 15% of the total portfolio value from the MAC-UPRO Surplus Portfolio to the Spending Floor Portfolio; and simultaneously making one’s annual spending withdrawals), then the allowable sustainable withdrawal rate with put option insurance of UPRO was found to be 5.70% (Table-1, 1st column). The remaining investment capital would always have been more than the $100 initial investment; and the end value would have been about $145, the inflation adjusted value of the $100 starting capital, as shown by the green performance graph in Figure-1. Calculated annual withdrawal amounts for an initial investment of $100 are in the Appendix, Table-3. They are compared with inflation adjusted annual withdrawal amounts. One can see that sustainable real spending would have been preserved, because the annual calculated withdrawal amounts are on average higher than the annual inflation adjusted withdrawal amounts. When following the Improved Floor-Leverage Rule without withdrawals of funds, then the combined portfolio (85% Spending Floor Portfolio and 15% MAC-UPRO Surplus Portfolio) with put option insurance would have shown an annualized average return of 8.35% with a maximum drawdown of -12.1% (Table-2, 1st column). The return is much higher than the 6.1% for the CREF Inflation-Linked Bond Account alone, and the maximum drawdown is also better. The performance of an initial $100 investment following the Improved Rule is represented by the red graph in Figure-1, and can be compared with the blue graph, which depicts the performance when following the Original Rule. 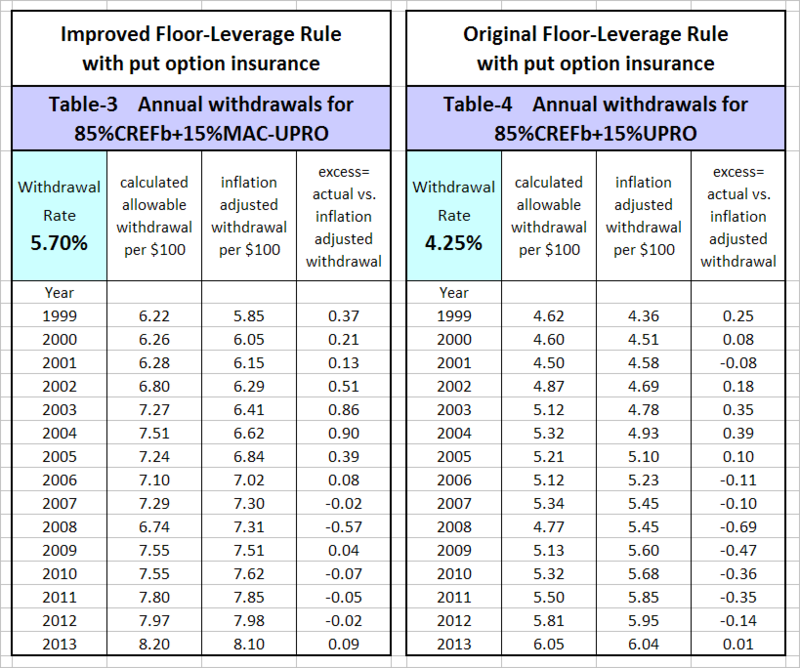 When following the Original Floor-Leverage Rule (annually moving funds exceeding 15% of the total portfolio value from the UPRO Surplus Portfolio to the Spending Floor Portfolio; and simultaneously making one’s annual spending withdrawals), then the allowable sustainable withdrawal rate with put option insurance of UPRO was found to be 4.25% (Table-1, 2nd column). Calculated annual withdrawal amounts for an initial investment of $100 are in the Appendix, Table-4. When following the Original Floor-Leverage Rule without withdrawals of funds, then the combined portfolio (85% Spending Floor Portfolio and 15% UPRO Surplus Portfolio) with put option insurance of UPRO would have shown an annualized average return of 6.47% with a maximum drawdown of -13.9% (Table-2, 2nd column). The performance is shown by the blue graph in Figure-1. The calculated return and allowable withdrawal rate are higher than what the Original Floor-Leverage model without put option insurance would have produced. 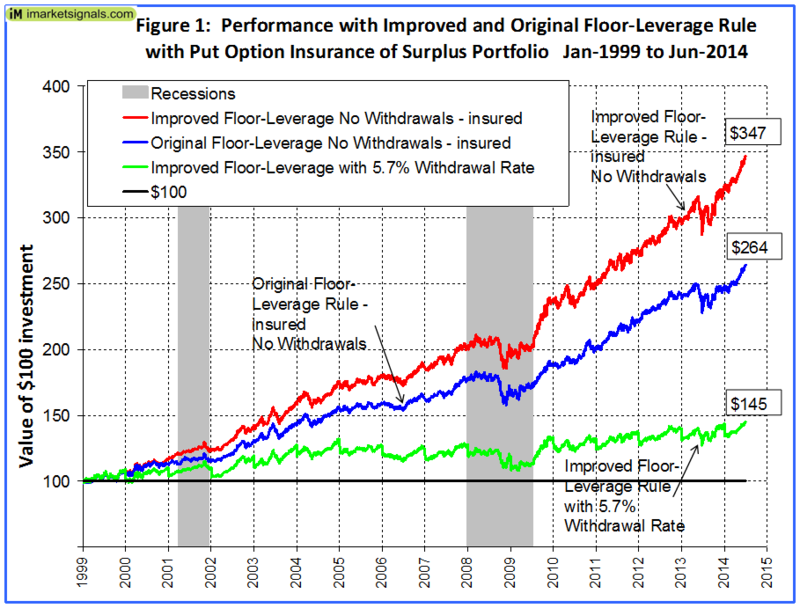 The use of the Improved Floor-Leverage Rule (85%CREFb+15%MAC-UPRO), together with buying put options to insure UPRO so that its maximum loss is limited to about 35% of its initial annual values, would have produced a lower return and a lower allowable withdrawal rate than the un-insured portfolio, as is evident from Tables-1 and 2. The reason for the lower values is that the MAC-System avoided investment in UPRO during down-market periods and put options would not have been needed. However, since nobody knows when a black swan event could occur, put option insurance would make sense to protect one’s capital. A safe withdrawal rate of 5.7% is still considerably higher than what the popular retirement strategy in use today, the 4% Rule, allows. When using the Original Floor-Leverage Rule (85%CREFb+15%UPRO), a good strategy would have been to insure UPRO with put options. This strategy would have limited losses of the Surplus Portfolio to 35% in the years 2001, 2002 and 2008, and would have provided a higher return and a higher allowable withdrawal rate than the un-insured portfolio. The allowable withdrawal rate with insurance becomes 4.25%, up from 3.25% without insurance. Similarly, when no withdrawals are made, the combined portfolio’s annualized average return improves to 6.47%, up from 5.76% without insurance. The MAC-System has been backtested over almost 65 years and has performed well over this long period. Weekly updates of the system are available on our website iMarketSignals.com every Friday and can be viewed at no cost the following Monday evening. One can also follow Best(MAC-UPRO) at Portfolio123. What happens if you don’t sell le Put options during the periods in which MAC sys is out (so you are net short on equity market)? That’s reflected in the analysis…they assume that you spend 68% of the always-invested put option insurance when using the MAC timing system, since it’s only invested 68% of the time. That simplifies the analysis, but I wonder how it compares to real life. I guess you’d still be buying 1-year options, but selling them when you sell out of UPRO? 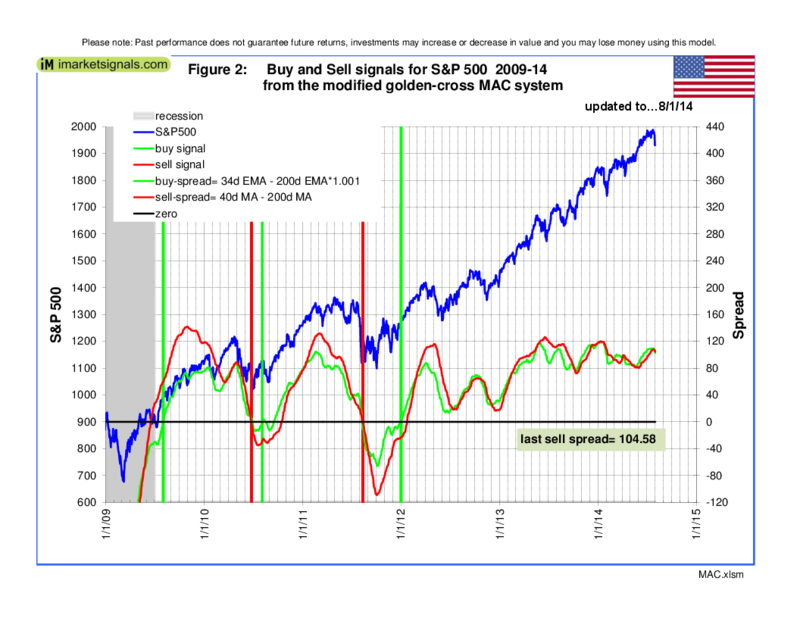 You might actually save more than 32%, if the MAC system has you buying after an uptrend has started and selling after a downturn has started, when everyone else is looking for protection. Thanks for your reply. Obviously one would sell the put option when UPRO gets sold. So one would get some money back and the put option costs would be less than for the original floor-leverage rule system which holds UPRO permanently.